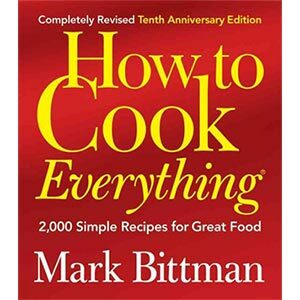 Mark Bittman wants YOU to cook 'cause he cares about people, the planet, enjoying variety and simplicity. I got turned onto Bittman from his Minimalist videos and I can say he has encouraged my curiosity and creativity in the kitchen. I feel so much more confident in my cooking since reading his books. He just makes you feel safe to throw together what you have in your fridge and pantry (which he teaches you how to stock) instead of making you feeling like you have to make a trip to a specialty store to purchased high priced items you'll use once. This book is incredibly comprehensive and yet "light" on details. It's more an encyclopedia of different dishes/techniques. This is a must have if you enjoy cooking! I have used this book for years and just got the newest addition! My favorite book on my book shelf! This book is wonderfulI brough because I needed a few tips and I feel like the tips are great not only did i pick up a few pointers for this years Thankgiving dinner but my turkey and all it's trimming were awesome. I also use this as a reference book. Have used it countless time when I was stuck on a recipe. My go-to; I use it all the time. I love that it is very flexible and gives many options for how to tweak a recipe. Love it! When I have a strange ingredient or just need some new ideas, this is the first book I pull off the shelf. The recipes are organized by ingredients then have several cross-referenced other ideas so it is easy to find what you need. Or, if I decide I want to make a classic dish like lasagna, I will find a basic recipe here with a few alternatives to try. All the recipes are very simple and basic, but tasty and inventive. It has become our new go-to gift for newlyweds. There is also a vegetarian edition that we added to our library just for more options. I love this ccokbook! It's a huge staple in my house. I love to cook and bake and I have learned to make so many good recipes using this book. I like the fact that it has illustrations on the how- to's of a recipe. Even though I have had it for a while, there are so many more recipes that I have yet to make.